RAC Breakdown and Accident Service pre-1920. Homepage. 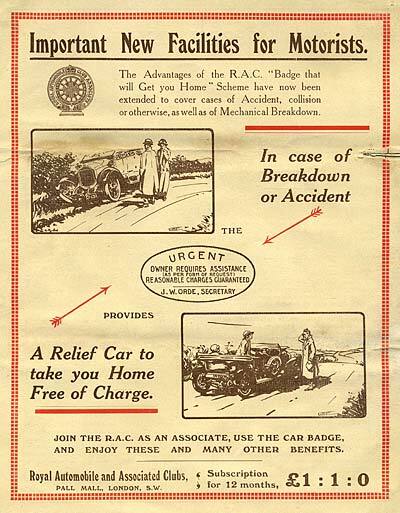 This page: News about the RAC's "Badge that will get you home" service in the 1910s. Leaflet issued by the Royal Automobile Club (RAC). "The Advantages of the R.A.C. 'Badge that will Get you Home' Scheme have now been extended to cover cases of Accident, collision or otherwise, as well as of Mechanical Breakdown." The unfortunate motorist would also benefit from a "Relief Car to take you Home Free of Charge". Subscription for 12 months would cost £1:1:0, which is £1 and 1 shilling (=5p) if I understand that right! The illustrations on the cover of the leaflet show a fine touring car with a wheel off, in a ditch, and another driver scratching his head with an expired motor car at the side of a road, about to get some ear-ache from his passengers. I beg to acknowledge, with thanks, the receipt of your letter of yesterday's date returning my Disc that I lately used to obtain assistance afer a breakdown. The system is an excellent one, and all motorists ought, for their own sakes, to become Members of their local Automobile Club affiliated to the R.A.C. or to become R.A.C. Associates, if only for the comfort and security engendered. I thank the R.A.C. for defraying the expense incurred on my behalf." 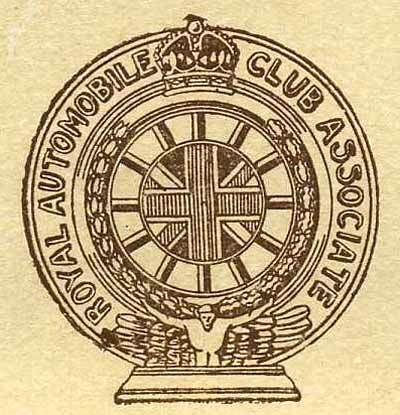 There were two membership options, either a direct member of the Royal Automobile Club, or else an Associate Member, joining an affiliated local motor club, of which there was a lengthy list on page 2 within the leaflet. The back cover lists some of the benefits of membership, along with a form to complete and send off to Pall Mall in London, if you wished to join. Benefits included the RAC Touring Guides (maps), Assistance in the case of Breakdown, Free Legal Defence, use of the RAC Touring Bureau (for tours at home or abroad), insurance, advice from RAC Engineers in connection with the Purchase, Sale or Maintenance of cars, being part of the RAC Register of Drivers, and finally exclusive use of the Reading Room at the RAC offices in Pall Mall. The RAC are building up their archive of memorabilia, more of which can be viewed in the archives section on their website. Return to the Car Collectables section.